Last weekend was another successful NFL Draft for UCLA as five Bruins heard their names called during the three-day event. Since Jim Mora took over prior to the 2012 season, UCLA is one of seven Pac-12 schools to have at least one player drafted every year. The Bruins have sent 25 players to the NFL through the draft in that time, the most for any school in the conference. What was that NFL talent able to accomplish at UCLA? UCLA’s 41 wins during the Mora era are the most for any UCLA head coach during a five-year span, but still ranks only fifth in the Pac-12 since 2012. Here’s a look at how each Pac-12 team has done in the draft and on the field in the past five seasons. The total wins since 2012 are plotted on the horizontal axis while the total draft picks, starting with the 2013 NFL Draft, are plotted on the vertical axis. Stanford is the most successful program when it comes to balancing wins and draft picks as the Cardinal ranks first in the conference with 53 wins since 2012 and is tied for second in picks with 22. UCLA is first in picks and fifth in wins, which is the largest discrepancy between the two categories among all the teams. Depending on what lens you’re using to view the program, you could say the coaching staff has been the best in developing talent for the NFL. On the flip-side, you could wonder why, with so many draft picks and so much talent, the Bruins can’t win more games. 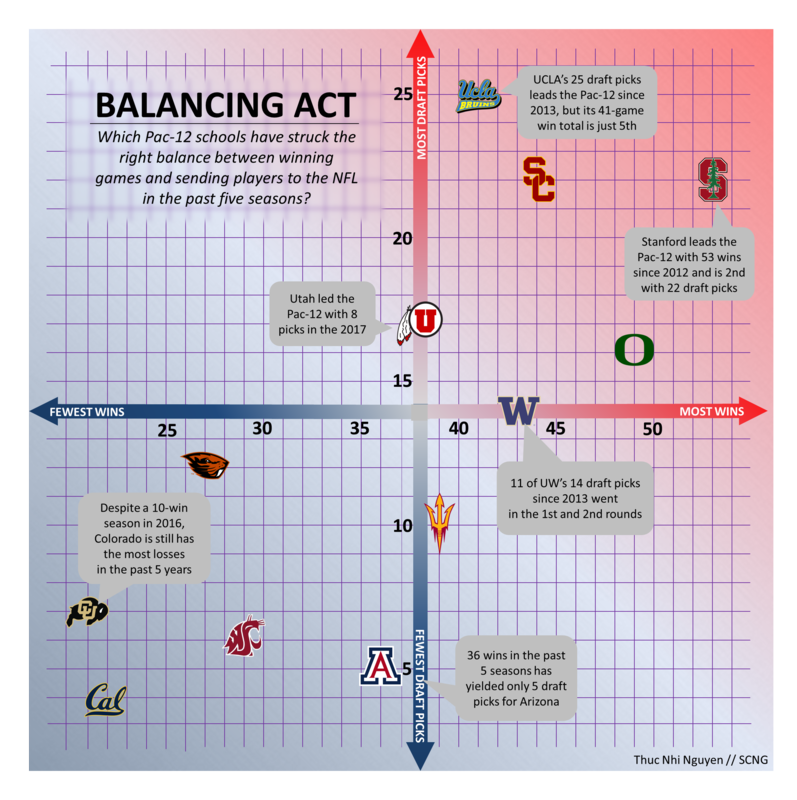 It’s similar to three months ago, when Athlon Sports looked at the disparity between UCLA’s recruiting classes and wins (a related chart can be seen here). Meanwhile, schools with significantly more wins than draft picks are Oregon (second in wins with 49 and fifth in picks with 16) and Arizona (eighth in wins with 36 and 11th in draft picks with five). Oregon and Arizona were the only Pac-12 schools without a player selected in the 2017 draft. The legacy of NFL players from UCLA is strong and I wouldn’t be surprised if it continues independent of how many wins the Bruins get. They had more draft picks (five) than wins (four) last year. Having so many NFL players come out of Westwood entices more talented recruits to come as the ultimate goal for many players is to go pro. For example, when Darnay Holmes announced his commitment to UCLA at January’s U.S. Army All-American Bowl, the cornerback from Calabasas High said “for the next three to four years” he’ll be playing at the Rose Bowl. He hadn’t even stepped on a college campus yet and he was already thinking about cutting his UCLA career short. In February, as Jayon Brown prepared for the NFL Combine, he told me the coaching staff’s experience with the NFL and early success in producing draft picks was “one of the reasons why (he) went to UCLA.” As long as UCLA continues churning out draft picks, more talent will come. But what does a university and a fan base value more? 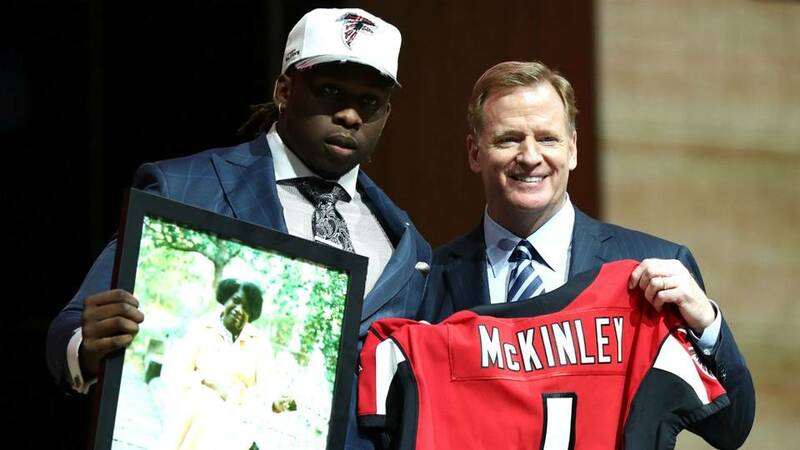 Are draft picks enough to make up for middling results on the field? Certainly, helping players achieve their NFL dreams is an accomplishment worth celebrating for a coaching staff, but the finding a way to excel at both would be the ultimate success. This entry was posted in Football and tagged NFL Draft by Thuc Nhi Nguyen. Bookmark the permalink. Want to go to the NFL? Pick UCLA. College is there to help you realize your dreams. UCLA is delivering. Amen, Bro. I really hope Deon and Marcos can make the Broncos roster! Go, Bruins! Thanks Thuc Nhi! It would also be interesting to know what the average star rating of the players drafted. That would also be an indication of the quality (or lack of) and ability of the coaching staff. The problem at UCLA has not been in recruiting. It has been coaching and developing players, particularly in the trenches. The number of draft picks doesn’t tell the whole story. A breakdown by the round taken in the draft would provide a bit more info. Mora, 4 – 8 in his 5th year. ‘Nuff said. 2017 will be better. Trump’s in the White House! The problem was recruiting a pure passer for an offense based on a running quarterback. Certainly you and LR agree on that. Mazzone had success at ASU with Osweiler, so apparently he didn’t know his own offense and it became clear he does not like to recruit. The cupboard was bare behind Rosen as well. What you can’t do is run read option in that offense with Rosen when you don’t have a decent backup. The QB has to run every now and then to keep the defense honest. Without a solid backup, you can’t risk it. Look what happened to Oregon when Vernon Adams went down. UCLA won 1 game with Fafaul. I think a Rosen style QB could have worked IF Mora had recruited for a drop back offense. Instead he was doing that dumb read option exposing Rosen to hits. Everyone knew he was not a real threat to run because of lack of durability. He had that great run against WSU his first year but that was a fluke desperation run at the end of the game. The run against WSU was a scramble, not a read option. Rosen almost never ran the ball on the read option which means it wasn’t an option. All he had behind him was Neuheisel or Fafaul. LR thought Jerry Neu should have started. Let’s just say I disagreed. UCLA could have run the spread without the read option, but they didn’t. Plus they failed in recruiting a QB prior to Rosen. While it’s normally better to have a mobile QB, it isn’t necessary if you have an OL that can protect the QB and also run block. The Bruins had neither last year. Do you expect the team to have an OL that can protect Rosen and run block so your defense isn’t gassed by the 3rd quarter? I expect that UCLA should be able to attract enough talent and coaching to get that done, year in and year out. I’m not sure what to expect this year, but it won’t be a good year without having some success at that and converting on 3rd down. That will also require receivers catching the ball consistently on all downs. The blogger should plot a curve of wins per year. The slope of that curve is negative. This is depressing. All this talent and nothing to show for it. When was the last time we played in a New Year’s Day bowl game? Rejoice in being a minor league proving ground for the NFL.